KANSAS CITY, Mo. — Iowa State stayed perfect in Big 12 championship game appearances after beating Kansas in their own backyard on Saturday. The Fifth-seeded Cyclones (23-11) used a big early run to set up a 78-66 victory over No. 17 Kansas here at Sprint Center in Kansas City and improved to 5-0 in Big 12 title games. Lindell Wigginton had 17 points and six rebounds off the bench, while Marial Shayok added 15 points for Iowa State, which became the lowest-seeded team ever to succeed in the conference tournament. 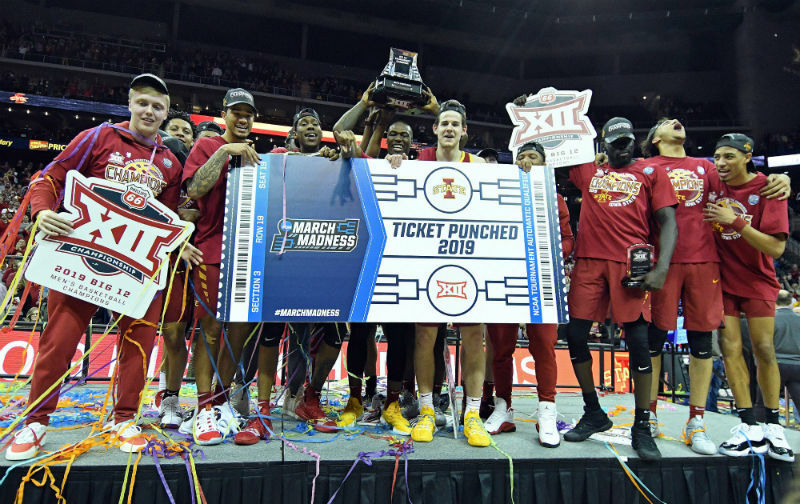 “When you do something special, you win a championship, you got a connection for the rest of your life,” said Cyclones coach Steve Prohm. Michael Jacobson finished with 14 points, five rebounds and two blocks and freshman Tyrese Haliburton scored 11 points for the Cyclones (23-11), who improved to 2-0 against Kansas (25-9) in the finals. Iowa State led 32-22 at halftime and improved the advantage to 41-24 early in the second half. Shayok won the tournament MVP, but he praised the team’s overall performance this year. Meanwhile, Dedric Lawson lead Kansas with 18 points, eight rebounds and three steals and Devon Dotson ended with 17 points. Quentin Grimes was 0 for 6 from beyond the arc and finished with 10 points for the third-seeded Jayhawks, while Marcus Garrett went 2 for 12 from the floor for seven points, but grabbed a game-high 15 rebounds in the defeat. As a team, Kansas, which shot 27.8 percent from the field and missed all nine of their 3-point attempts in the first half, ended the game with a 39.4 percent shooting from the field. They were 3 for 18 from long-range. Iowa State, in the meantime, shot 48.1 percent on 26 of 54 shooting from the floor.